My reading pace is a little slow just now. Had some translation to do on Monday, and now I’m working hard on preparing for my lecture at Union University in TN next Tuesday. 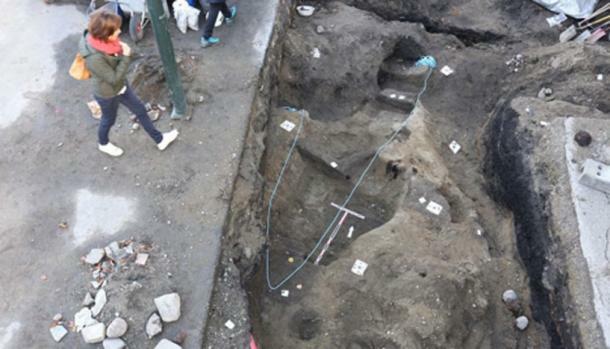 While Norwegian archeologists in Trondheim’s city, excavated the market area, they stumbled upon a curious discovery. It was 13 feet long, and while the wood had been destroyed over time, evidence such as nails and rusty lumps indicated that it was a boat. The boat dates from the 7th to the 10th century, a time when Vikings wandered the seas, raided and explored, according to the initial analysis. Inside the boat, burial goods such as bronze, a piece of a spoon, and a key to a small box were discovered, alongside 2 long bones. The DNA testing is yet to prove if the bones are human or provide any details that might bring more information about the person possibly buried in the boat. The article indicates that scholars are surprised by the age of the find, but I don’t find it surprising that there would be human habitation, and burials, in Trondheim before the turn of the millennium. Trondheim didn’t become really important until Olaf Trygvesson’s time (around 1000), but we’re talking about arable land in a soil-poor country. Trondheim is a nice spot, with a good port. I’d be surprised if somebody wasn’t living there. The silk patterns were originally thought to be ordinary Viking Age decoration but a re-examination by archaeologist Annika Larsson of Uppsala University revealed they were a geometric Kufic script. 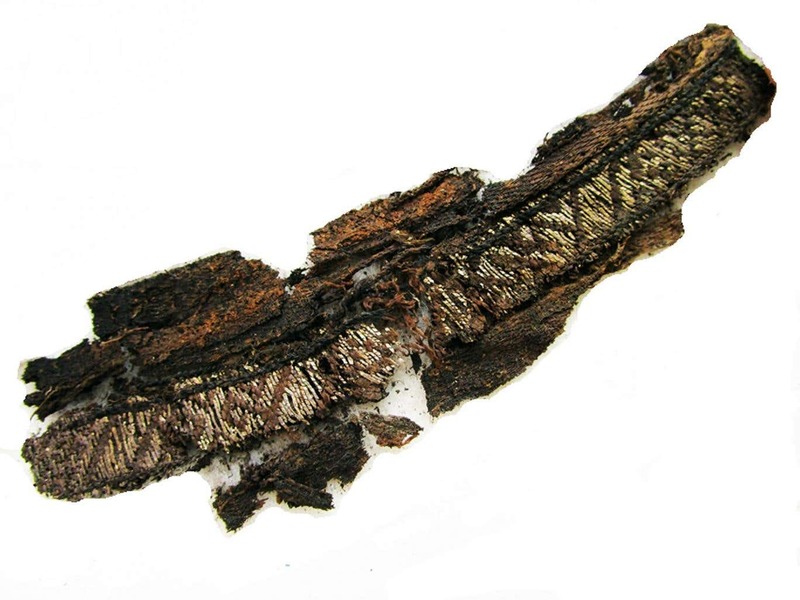 They were found on woven bands as well as items of clothing, in two separate grave sites, suggesting that Viking funeral customs had been influenced by Islam. I was skeptical about this story from the git-go. In the first place, the pattern looked like a fairly standard geometrical pattern, very much like the kinds you get from tablet weaving, common in the Viking Age. Secondly, even if the pattern was derived from Muslim script, that does not imply belief. The Vikings had strong trade contacts with Baghdad, to whose representatives they sold thousands of slaves every year. Arabic silver coins (dirhems) are one of the most common objects found in Viking hoards, especially in Sweden. Arabic coins have no pictures, in keeping with Islamic law. Just the flowing, graceful Arabic script. It would be no surprise if the shapes of the letters might have inspired a Viking embroiderer. No religious motive should be assumed. Now, as expected, there’s been a rebuttal, even more categorical than I expected. Stephennie Mulder, a professor from the University of Texas in Austin, said the error stems from a “serious problem of dating”. She claims Kufic script did not occur until 500 years after the Viking age. “It’s a style called square Kufic, and it’s common in Iran, C. Asia on architecture after 15th century,” she wrote on Twitter. Listen archaeologists – I know you want to see your names in the papers. And I know it’s good for your careers to make the most exaggerated claims you can, in the service of multiculturalism. But stop trying to promote your causes by exploiting history. That’s the job of historical novelists. Like me. A number of people have drawn my attention to an article recently published in The American Journal of Physical Anthropology. I think I’ve seen it linked at least twenty times of Facebook: A Female Viking Warrior Confirmed by Genomics. Several people asked my opinion of it. My initial responses were brief. I had a pretty good idea that there was more smoke than fire here, and that the article was going to get some pushback.